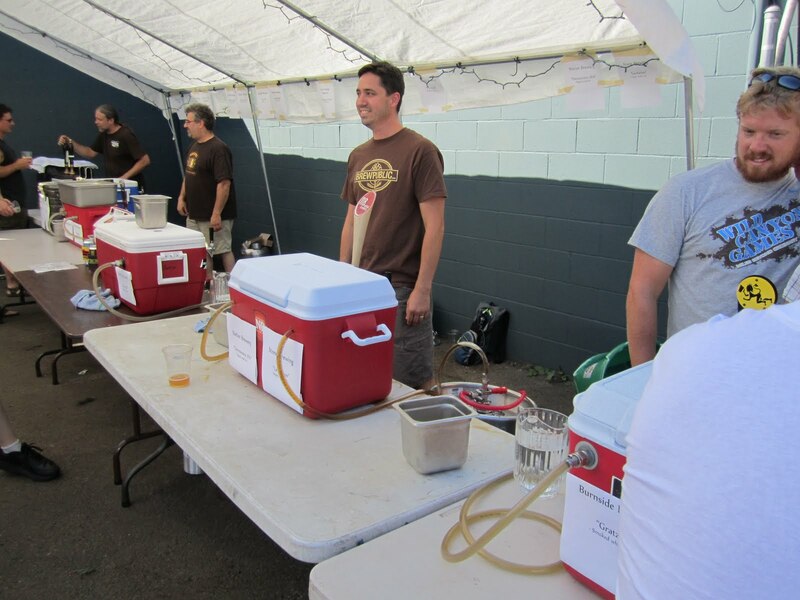 The Mighty Mites small beer festival that was held Saturday at Coalition Brewing was a phenomenal success, at least from the perspective of the festival-goers. There could have been a little more shade, but the beers were fantastic, they didn't give you a hangover, and there were no lines to speak of. I expected a bigger attendance than there was -- hopefully Coalition at least broke even for their effort. As I said, I didn't have a bad beer at the festival, but those stood out for me. I was mostly doing one-ticket samples, though I did venture back for a full -- well, almost full -- pint of Little Sir John pulled from Ted Sobel's mobile beer engine. That was some good drinking. The atmosphere at Mighty Mites contributed to the good time. Everything was very casual: no wristbands, bring your own mug or get handed a compostable cup, generous pours, no lines and no silly festival whooping. There was no entry fee or penalty, just buy as many or as few tickets as you wanted. Interestingly, many of the pourers were the brewers themselves, as in the photo at the right where you have (from left) Ted from Brewers Union, Alan from Hair of the Dog, Mike from Beetje, and Krister, one of the brewers from soon-to-open SE Portland brewery Base Camp. There were three people from Base Camp pouring at once during the early afternoon: Justin and Faye joined Krister. Nice community service, guys. It's worth talking about the Little Dogs. As you may already know, they are small beers made from the second runnings of the malt used in Hair of the Dog's giant flagship beers. Great way to reuse and recycle, and it lets Alan squeeze another dollar out of his malt bill. They're also very tasty beers, thanks in part to the lavish dose of hops administered to them. The two on tap at Mighty Mites were Little Fred -- made from a batch of Fred, of course -- and Little Adam, but not the smoky Little Adam that has been served in the past at the HotD tasting room. Alan explained that his runs of Adam consist of five parts smoked malt to one part dark (not smoked) malt. The Little Adam at Mighty Mites -- also currently on tap at the tasting room -- is a small beer made with the unsmoked part. I love the smoked version, but there was also something special about this unsmoked one -- you got more of the beer and hops flavor instead of the smoke gimmick. There were a few breweries that I was surprised were not represented at the fest. Hopworks has a wonderful hoppy session ale called Cool Grand that would have fit in perfectly; the Lucky Lab has been known to dabble in the light arts also. Surely big boys like Deschutes, Widmer, and Laurelwood would also jump at the chance to do something special for a fest like this. Not that there wasn't enough good beer, but if small is beautiful, the more the merrier. With all the recent attention on "session beers", it's high time Portland had a festival of this kind. It's fitting that Jeff had a hand in it: he first evidenced a desire to throw a small beer fest in Portland over two years ago at the bottom of this post. By that time Lew Bryson had already instigated session beer festivals in Philadelphia in 2007 and 2009. Of course Lew has been a vocal proponent of lower-alcohol beers for a long time, but it's nice to see that Portland has now jumped on the bandwagon in a serious way. Kudos to Jeff and Coalition for making Mighty Mites happen, and let's hope it will become an annual event. Coalition deserves huge credit for stepping in when it looked like we might have to scrap the fest, and I hope they weren't punished for the late start on promotion. The crowd was sparse for the first part of the day, and I couldn't tell whether it was because of my crappy promotion or the heat--which was considerable and started early. It's worth something that you appreciated it, Bill; I know you're a fan of bigger beers, so liking what was on offer at Mighty Mites gives me hope that small beers have a future. Fantastic! Great credit to Jeff and Coalition for this. I hope we can do something as ambitious and dedicated here in Philly soon. Not a huge success, but we did have some fun. Things are really starting to percolate, and I'm pleased, but not at all surprised, to see the enthusiastic brewer participation in Mighty Mites! This sounds fantastic! I wish I could've been there. Thanks, Lew. I added a link to the 2007 Sessionfest. We really are late to the party here. Jeff: Doubled! Actually, I'm not surprised, I can think of many candidate beers/brewers. If they do PDX Beer Week again next week, I hope you'll step back in to your curatorial role and help out with another Mighty Mites. Great name, by the way. Nice to finally see a Drink fest rather than the normal Drunk fests! This might have been a bigger attraction if organized with a national or international selection of lower alcohol beers. Power in numbers.... and more interest. Keep it hush so that next year some more beers will arrive, and the lines will remain zip nada. Block 15's beer shined for me, and I would love to just lay in a kiddy pool while drinking a few gallons of the stuff. I liked being able to leave the event non-drunkard. I also thought the fest was excellent and would like to thank Jeff and Coalition for putting it on. I hope it was worth if for both parties and they continue Mighty Mites next year. The Base Camp Brewing Co. three that showed up are Justin Fay, Kristen Fay, and Krister Balme. 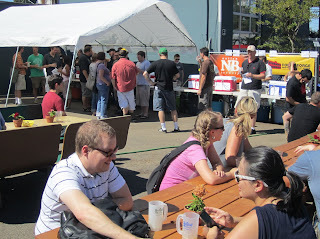 We were happy to help and can't wait to be a part of Portland's amazing beer community.